Tech Blog: How to upgrade or downgrade data schema ? I ll continue with this tutorial to show how to upgrade or downgrade the database schema. Suppose we need to add one more field ManagerAddress in our existing Managers tables, To do this we need to use one feature called Migrations . It allows us to have an ordered set of steps that describe how to upgrade (and downgrade) our database schema. Each of these steps, known as a migration, contains some code that describes the changes to be applied. Configuration.cs : It contains the setting that Migrations will use for migrating ManagingContext. <timestamp>_InitialCreate.cs – This is your first migration, it represents the changes that have already been applied to the database to take it from being an empty database to one that includes the Manager and Employee tables. Now we will add one more field ManagerAddress to the Manager Model. Run the Add-Migration AddManagerAddress in the Package Manager Console. The Add-Migration command checks for changes since your last migration and scaffolds a new migration with any changes that are found. We need to  give migrations a name; in this case we are calling the migration ‘AddManagerAddress’. 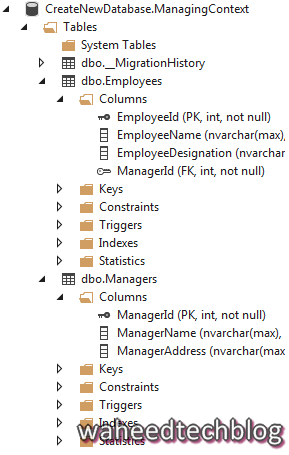 The scaffolded code is saying that we need to add a ManagerAddress column, that can hold string data, to the dbo.Managers table. If needed, we could edit the scaffolded code but that’s not required in this case. Run the Update-Database command in Package Manager Console. This command will apply any pending migrations to the database. Our InitialCreate migration has already been applied so migrations will just apply our new AddManagerAddress migration.